Toshiba's Satellite range comprises its consumer laptops and the Satellite A500-11U, while not that portable, offers surprisingly good performance and a truly stylish design. The 16-inch screen boasts a widescreen 16:9 aspect ratio and watching films is a pleasure, with no black bands sandwiching the picture. Detail is average, thanks to a 1366 x 768-pixel resolution, and the screen coating enhances colour reproduction, but it is reflective in bright conditions. Build quality is satisfactory and the laptop looks great, with shiny patterned plastics adorning the chassis. A line of touch-activated hotkeys give you quick control of media applications, as well as Toshiba's Eco Mode function for managing performance and battery settings. The keyboard is a little spongy, but still provides a fluid enough action, and Toshiba has also implemented a dedicated numeric pad, which is useful for inputting data. The keyboard is fully backlit and is, therefore, ideal for working in low-light conditions. The multi-gesture touchpad is very responsive, letting you scroll through documents and zoom into photos, for example, using just your fingers. 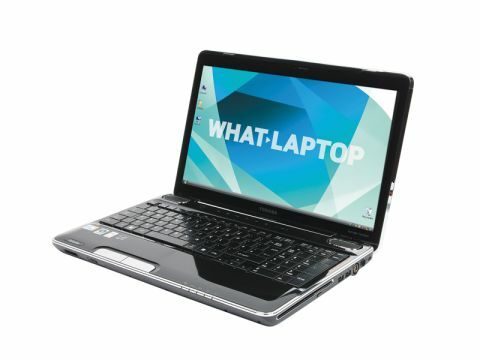 An Intel Core 2 Duo processor is joined by 4GB of memory and everyday performance is very fast. You'll certainly have no problems multi-tasking with office or media-intensive applications. Thanks to the powerful dedicated ATi graphics card, 3D performance is also very good, meaning you'll have no problem editing photos or video and playing the latest games – although you may have to turn down detail settings in more resource-intensive titles. The 500GB hard drive is generous and capacious enough to hold an entire family's files. At 3.3kg, it's quite a heavy machine, and portability is further hindered by the 129-minute battery life which means you will have to carry the charger with you when travelling. Nevertheless, extra features are impressive, with a digital tuner included for watching TV on the go and also Harman Kardon speakers that successfully enhance the laptop's audio experience. 802.11a/g/n Wi-Fi and Gigabit Ethernet are present, providing fast wireless and wired connections to networks. There are four USB ports, one of which boasts Sleep & Charge technology that lets you charge USB-compatible devices while the machine is asleep. An eSATA interface is also in evidence, as are VGA and HDMI ports for hooking up to external monitors. The Toshiba Satellite A500-11U is a very impressive machine and, despite average portability, it's a competent and feature-packed laptop that justifies its price tag.